Apollonia was a Christian martyr, killed in a local uprising in Alexandria, in the year 249 ce. Scant information is to be found about her life, but her death is well-documented. Historians note that the reign of Philip the Arabian was not the most tranquil for the Roman Empire. During the celebrations of the anniversary of the founding of Rome in 248, a crowd arose in Alexandria that was overcome with nationalistic feelings. In their fervor, they began attacking local Christians as traitors to the emperor. Dionysius, the local bishop, wrote a letter to Bishop Fabius of Antioch, documenting the attacks; the letter later became part of Eusebius’s Ecclesiastical History, which provides an account of the development of early Christianity. Dionysius describes a general panic in the city, with Christians fleeing to safety if they have the means. 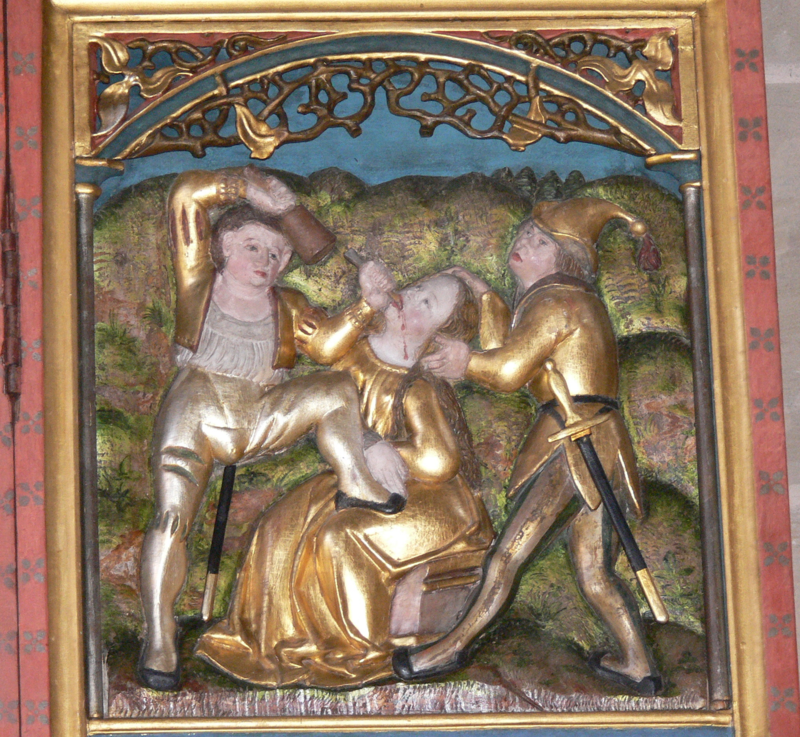 Apollonia, however, does not flee and is attacked by an angry mob who punch out all her teeth. The crowd then threatens to burn her alive if she does not echo their denunciation of Christ. Thinking quickly, Apollonia asks to walk a little ahead of her captors, in order to think about her choices, and when they let her go, she throws herself into the fire. She dies rather than give up her faith. While the story of Apollonia is unfamiliar to us today, it is significant that Dionysius describes Apollonia as “parthénos presbytis.” It can be literally translated as “elder virgin” and seen as a descriptor of Apollonia’s agedness or an explanation for why she didn’t flee the city. Some modern scholars also think the term may denote ordained leaders of the early church. It is therefore possible that Apollonia was an early ordained leader martyred for her faith. In art, Apollonia is depicted holding a pair of pincers in which a tooth is held. She is the patron saint of dentistry and those who suffer from toothaches because of her unfortunate dental torment right before her death. Her relics are located at the church that bears her name in Rome, as well as in Antwerp, Brussels, Mechlin, and nearly every other major city in Europe. 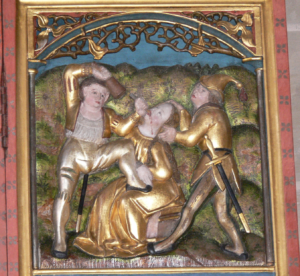 Devotion to Saint Apollonia and fascination with her tooth-healing abilities was widespread during the Middle Ages, perhaps because of the sad lack of flossing. Almighty God, by whose grace and power your holy martyr Apollonia, triumphed over suffering and was faithful even to death: Grant us, who now remember her in thanksgiving, to be so faithful in our witness to you in this world, that we may receive with her the crown of life; through Jesus Christ our Lord, who lives and reigns with you and the Holy Spirit, one God, for ever and ever. Amen. 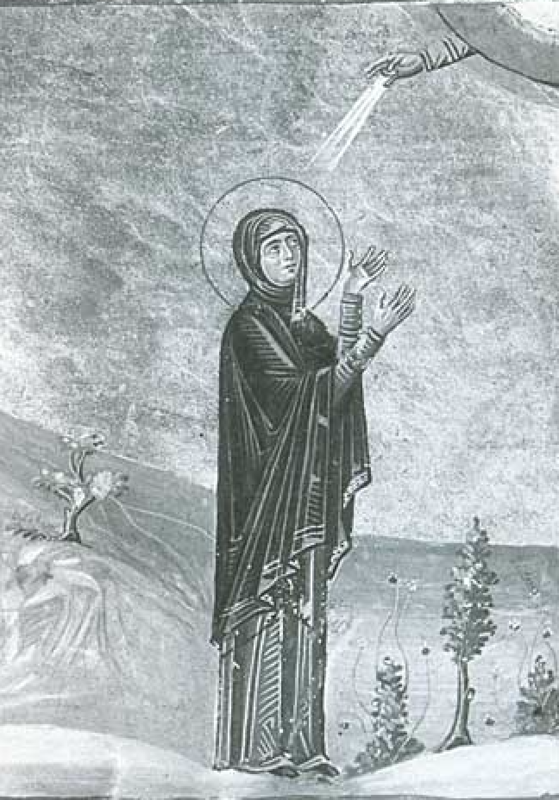 Zenaida and her sister Philonella were born of a Jewish family in the city of Tarsus around 100 ce. They were baptized into the faith following the evangelism of their brother Jason. They are known in the Orthodox Church as the earliest female physicians to follow Saint Luke in their ministry of the sick, and they were known as “unmercenary” healers, refusing to take payment from their patients for their services. 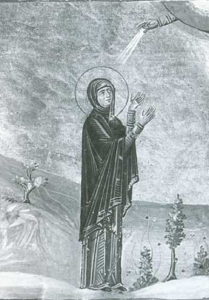 Like many early saints and biblical figures, little is known about Zenaida. She is thought to come from a well-educated Jewish family with ties to Paul the Apostle. Her brother Jason was one of the first bishops of the church in her native city of Tarsus. Truly, Zenaida and Philonella were descendants of the first members of Christ’s church. They could be considered Christian royalty, if you will. We can also deduce Zenaida was intelligent and well-educated, as she attended formal schooling to study medicine. Upon completion of her studies, Zenaida and her sister moved their practice to the mountains of Pelion in Thessaly. The area was well-known for catering to the rich and affluent members of society, and Zenaida and her sister were expected to serve only those who could pay for their services. Bucking the prevailing attitudes of society, Zenaida and her sister opened their practice to all, refusing payment and serving the lowliest of the low. They implemented practices that were based in modern scientific principles of medicine and confronted healers in the area who tried to make money off of superstitious amulets and phony charms. Some accounts say that Zenaida and her sister were stoned to death, while some say they both died peacefully in service to God. Other accounts say Zenaida died after stepping on a nail. Merciful God, whose most dear Son came to heal the sick, raise the dead, cast out demons, and preach the gospel to the poor; Teach us by the example of your servant Zenaida to freely give even as we have freely received; through Jesus Christ our Lord. Amen. 124 Comments to "Apollonia vs. Zenaida"
Never charged, nor abused her position. So today I’m supporting her mission. “Charlatans”—now that’s a word to lift your hat to! Good one, John. Zenaida makes me think of Dr. Susan Anderson, “Doc Susie” who practiced in the mountains of Colorado after being turned down by male dominated practices elsewhere. Doc Susie’s first patient was a horse who’d gotten tangled up in barbed wire, but after that she served her community for many many years. Of course, I had to read that as “charletahns” — being a bit OCD. Another gem. Our musical tribute is sung to the tune of “Dentist!” from “Little Shop of Horrors” which seems apt given the circumstances. When Phil was Caesar, Rome was not very chill. Mob scenes would break out leading folks to kill. When things got ugly, yo! And decided to make Christians pay! She burned so she won’t acquiesce. Watch her heal for no pay. Oh, what gall! Like a 1st Cent’ry Medicare plan for all. Poor patient: Oh, I’m sick. What do I owe? Zenaida: Just thank God I’m not your HMO. Take comfort to know that Christ Jesus does love them. Hilarious!! A stroke of genius, choosing that song was! So clever and apt!!!! I look forward to your songs every morning! This A goes with Zenaida. That’s a number 1 hit! Brilliant song today!! But then again, you’re amazing that way, Michael W.!! Huzzah!! “Just thank God I’m not your HMO” – priceless! You are a musical genius, Michael. Thanks for all of the show tunes. I am struck by the stories of saints who stay behind when the world is falling apart, from the sack of Rome to the Martyrs of Memphis. It is such a powerful witness of solidarity. Yet, today, I find Zenaida’s story more inspiring than Appollonia’s. I also have a few parishioners who are so devoted to community healthcare that is really making a difference in our area, so I see today’s vote for Zenaida as a vote for their ministry, too. Thank you for the opportunity to learn about to very fascinating ancestors in the faith! Your reflections mirror mine. Apollonia gave it all the hard way. Yet Zenaida also gave all she had. I hate having to choose. Both moved me. One was not “better” than the other. Being bivocational, I chose to work in community mental health myself as an LCSW for many years. The Appalachian people are mostly invisible to the larger country but their poverty is similar to other cultures. Working with them was a joy most of the time. Their survivalist spirit is something to admire and they are one of the few cultures to be truly able to laugh at themselves. Now I see a few clients for cash for what they are able to pay for at least half the cost on a sliding scale. The insurance debacle and government meddling creates unaffordable mental health care for many and places excessive burdens on therapists. Bless you in your work! Friends of Peace, that nailed it for me. Health care to all led me to Zenaida. I was at first drawn to Apollonia due to my own dental struggles, but finally had to admit Zenaida is indeed more deserving of a golden halo. Perhaps Apollonia could be awarded some golden dentures? Not finding many of the saints this year very inspiring. Apollonia was going to burn anyway. Zenaida seems nice. Went with Zenaida. Hope they are saving the best of the stories for later rounds, which I wish they would not do since it probably results in uninformed voting. Zenaida, because I used to volunteer at Columbia Road Health Services, a medical clinic where anyone was welcome, and fees were based on your income. If you had no income, you paid nothing, but still received medical treatment and lots of love and care! Love them both, but going with Zenaida since I’m a strong proponent of universal healthcare as a human right. As if “A to Z” weren’t bad enough, to add to the pain, in the collect for Apollonia, the patron saint of dentistry, we pray, “that we may receive with her the crown of life.” Yes, a gold crown, or several of them, if needed. May it be so. Voted for Apollonia while waiting in the dentist’s office during my wife’s appointment. Asked Apollonia to be with her and comfort her. That sounds like an excellent idea. Wouldn’t want to get on Appolonia’s bad side, under the circumstances. Zenaida because the picture is so much easier on the eyes. When I saw that Apollonia was popular in the Middle Ages, “perhaps because of the sad lack of flossing”, I laughed and was ready to vote for her. As a physician myself, Zenaida however won out because of her service to the poor and her practice according to the available scientific principles, and calling out of charlatans. I want to vote for Apollonia. I’ve been studying Luke for a year-and-a-half, and his admiration of widows (or elderly women) and his lifting them up as leaders in the early church seems to be what is reflected in Apollonia’s story. Plus I’m a huge advocate of flossing, and though I have obtained many crowns in my later years, I attribute that to lack of flossing in my early years. I am sad that she went to such a fiery and painful death. But I went with the whopping majority for Zenaida. Anyone who treats for free the indigent mentally ill people of the world has my vote here and in November. Plus, it gave me chills to think that she was a 2d generation Christian! Living out their discipleship by service to the poor did it for me. I voted for Zenaida because that means I also get to acknowledge her sister Philonella. Kind of a 2 for 1 day! So glad you mentioned her sister Philonella. With her sisters help they made quite a team. My vote goes to Zenaida in prayer for and honor of those with psychiatric disorders and their families. Two millennia later, their healthcare needs are still woefully underserved and underfunded. Tough choice as always. My sentiments went for Zenaida but I was married to a dentist for 47 years and thus voted for Apollonia. Zenaida and her special care for those struggling with mental illness gets my vote. Since Apollonia’s saintly qualifications are having her teeth knocked out and basically committing suicide (jumping into the fire on her own) I went for Zenaida’s life long devotion to healing. Especially working with the mentally ill.
Zenaida gets my vote today. My grandmother healed by faith and her knowledge of home remedies. Faith healing works and she did it for free. She was revered in the town where even today 51 years after her death people remember her healing ways. We voted for Z today, not only because she provided free medical care, as well as helping those with mental health issues. Especially poignant as one of our choir member’s 25 year old son, who suffered from depression, committed suicide and his funeral is tomorrow; they are very much in our prayers this day. So very sorry to hear of this suicide. Few things in life are as tough as when a beloved young person takes his own life. Christ be with his family, and your entire congregation. Or an older uncle…. Prayers for all those who despair, and those who lose them…. I voted for Zenaida based on the account of her work as a physician, her care for those who could not afford treatment for their ills, and, in general, hers was a life given to service. The glimpse we have of Apollonia is the same glimpse we have of thousands of other Christians who had the misfortune to live in perilous times – she got beaten up and killed. Not a pleasant death, I agree, but what do we know about her before that dark day? If everyone who died for Christ before the Edict of Milan was issued sainthood would be cheap. Interestingly, Philonella, who is mentioned only in passing in Megan Castellan’s biography of Zenaida, is co-celebrated with her sister in the Eastern Orthodox Church, and they share October 11 as their feast day. In part, then, my vote for Zenaida is also a vote for Philonella. Truly two amazing saints whose witness is relevant for us today in our own age of nationalism and for-profit health care. I had to go with Zenaida, because of her care for the very poor and those, like me, with mental illnesses. My church hosts ministries that provide health care to the very poor, the uninsured, and the homeless, so this is close to my heart. I like you, Elaine. Thanks for sharing your tidbits, I found this all refreshing! Thanks–I’d forgotten about the Edict of Milan! Voting for Zenaida in thanksgiving for the wonderful NHS, offering free health care to all, and founded in Christian principles. My vote for Zenaida is all on you, Anna Fitch Courie. I was all set to vote with Apollonia, thanks to my love of Eusebius and my fears that Medicare plus supplemental insurance won’t cover needed dental work when I came to your collect for Zenaida, the devout and generous phycian. It so perfectly summed up the prayers I’ve been offering this morning that I had no choice but to vote for the last (alphabetically) of this season’s saints! My involvement with the healing ministry drew me to Zenaida. However, I went with Apollonia. Her example and intercession for persecuted Christians today is needed. Also brought back memories of a wonderful statue of Santa Apolonia by Goler seen this summer at the Harwood Museum of Art in Taos, NM. Zenaida for free health care. Anna Fitch Courie for her book review and because she uses those little sticky tabs to mark her favorite pages. Tough vote today. Accomplished women (ordained leader) vs. physicians. Went with Zenaida, for her long life of ministry to the poor and mentally ill.
My vote went to Zenaida today as I have seen so much suffering from mental health issues in children and adults. I always vote for the loonies and those who care for us. “Scant information is to be found about [Apollonia’s] life, but her death is well-documented.” “Little is known about Zenaida,” but apparently a whole lot more than about Apollonia; on the other hand, accounts of her death are all over the map. For me, what is reported about her life carries the day, for all the reasons mentioned above by others. All power to the zed. I vote for the early women physicians. I especially like that they treated the poor and attended to children with depression. I assume that means they drove out demons. Given today’s ghastly phenomenon of parents refusing to give their children vaccinations, with the most recent horror of the parents who refused to vaccinate their son for tetanus at a cost of $800,000 to the community to save his life–and they still refused to vaccinate him (some demons won’t be driven out)–I accept the story of Zenaida’s unfortunate nail in the sole as an exemplary lesson to get vaccinated. I shudder at Apollonia’s story, because it smacks too much of suttee: burning inconvenient single women. Sublimating the story by saying she voluntarily threw herself into the fire so as not to repudiate Christianity would be exactly the same if she didn’t repudiate Hinduism. So I’ll none of it. Humans have to stop burning women. I go for the women physicians today (without the “Christian royalty” theme, please; we are having enough problems with entitlement in our politics today). The Zed sisters for the win. Zenaida for me today. Her gift of healthcare for those in need who otherwise would suffer their illnesses because they were unable to pay falls right in line with my position that everyone deserves to have medical attention when needed. I need some dental intervention, so I’m with Apollonia. I think Apollonia threw herself into the fire because a) she knew it was inevitable that she was going to end up there under the circumstances & b) by throwing herself in, it prevented the nationalists from committing the sin of murder. Talk about loving your enemies. As for anyone apart from the King of Kings being called “Christian royalty” . . . as Christ our King said Himself, the first shall be last and the last shall be first in His Kingdom. I have rarely had any good dental experiences, so I’m voting for the physician who with her physician sister practiced medical care for all. Zenaida ‘s life meets all that we strive to be as Christians. Nothing more to say except God bless Apollonia also. Funny thought , Apollonia I believe was the name of Micheal Corleone’ s first wife in Sicily in the movie, The Godfather. Yes, Apollonia is her name. Unfortunately, she also meets a fiery end. But should you not be the Alpha to Omega of the saints? Or the Aleph to Tav? Before reading the bios I assumed I would vote for Appolonia, since I worked as a dental assistant for many years. But, Zenaida’s story compelled me by her true calling to serve the needy. That will always be decider for me. Sorry for mistyping Apollonia’s name. It’s early and my new glasses are not working so well ! Great and tough choices! Where can I report that my votes have not registered on my screen for three days now? Same problem here . . . I COULD vote again and again – of course, not doing that! Zenaida. I have a family member recently released from her second go round in a psych hospital. Gotta go with the patron. No contest. I vote for the woman who defended science and reason against scam artists and hucksters and cared for the entire community. I love the Madness fan who pointed to the heroics of Christians who stayed behind. I loved the neat connections Zenaida had to Paul (perhaps) and to Luke (well, do they say). I’m also amused that a physician, who did not charge, was in itself, a virtue that comemded one to sainthood. As one who has suffered much from the care of dentists, I could easily have voted for Apollonia. However, the last part of my working life was spent as a hospital chaplain, often serving in the adult psych unit, and ministering to patients from both psych units when a nurse brought them to the services I led in the chapel. I have to go with Zenaida, in memory of my most-loved profession, and also of my grandmother and her mother-in-law, who were herb doctors and spiritual healers. I still live in healing prayer for all I hear of who need it. I am so grateful for Medicare, and for the Medigap insurance that picks up where that leaves off, who have treated my broken hip and other problems from that fall at very little expense to my husband and me. Note to those about to retire, or in retirement, DO take Medicare, and DO look for a reliable company for Medigap. It is really worth it, though not free. I choose to believe that Zenaida died after stepping on a nail. “Modern” as her 2nd century medicine was, she didn’t have a tetanus shot! But universal health care wins my vote for today. So good to learn about both these remarkable women! I am moved by Apollonia’s story, but find Zenaida irresistible, for all the reasons previous commenters have cited. Is her sister and partner a saint too? It sounds like she she should be. Having gone through some serious dental procedures recently, I have to vote for Apollonia. Had I known of her before the procedures, I would have prayed to her. I bet no medical insurance company would choose Zenaida as its symbol. Appollonia to watch over the wonderful young people who work for us. Went for Zenaida mainly for providing medical care to those who couldn’t afford to pay and partly because I used to work for a splendid woman named Zenaida. So tossed a coin, Zenaida won! Child psychotherapist here. Zenaida was the obvious choice for me. I will adopt her as my person saint! I was, at first, enchanted with the story of Apollonia. I had a great Aunt Apollonia and was always thankful I wasn’t named after her. My father was a dentist…..so she was in the running, until I read about Zenaida. Zenaida’s story was much more compelling. There re several dentists of various types in my family, including my daughter. I also want to support the concept of ordained women in the early church, so am voting for Appollonia today. Zenaida is a most worthy opponent, for all the reasons given. As a retired pediatrician Zenaida was my choice–medically available and an interest in children. Where can I find a list of the winners in sweet sixteen bracket, so I can fill in my score card? Sounds like Zenaida prefigured universal health care by about 2,000 years. Tough to go up against the patron saint of affordable health care. I really don’t like saying it was a “no contest” day for me, but Zenaida had it pretty much out of the gates. After personally being impacted by healthcare costs for the first time in my life, I hold nothing but reverence for a woman delivering care to the least of us free of charge around 100 CE; will we never learn? Why so few votes for Apollonia?? The poor woman had her teeth knocked out AND she was burned alive! She deserves to win for just one of those hideous events, let alone two!!! Umm – I do believe that may be Philonella’s picture, not Zenaida’s. The remainder of the picture from which the above extract was taken shows a woman sitting on the ground, her foot bleeding from a cut caused by a nail. That woman would be Zenaida, right? You are quite right, Mh! The sitting woman also has a halo. A woman giving out medical care for free gets the vote of this retired nurse! Besides she was a Christian in Tarsus where my American great-grandfather and his wife spent many years ministering to the Armenian Christian community during the genocide. However, I do like the write up about Apollonia, now I know who think of as I sit in the dentist’s chair! Too bad there is no “edit” button: who TO think of is what I meant! I’m voting for Zenaida, one of the very first medical missionaries. Blessed to have learned of her story today. I hate to think what medical care was like in 100. My vote goes to the early church physician, Zenaida. The description of her and her sister’s exercise of “modern scientific principles” in their medical practice brought a smile, given the state of medicine in the first century CE. Why doesn’t Zenaida’s sister have a name? Zenaida, Zenaida, Zenaida…. It’s always about her. Zenaida’s entry above begins Zenaida and her sister Philonella (emphasis mine) . . . . I had to vote for Apollonia because I once had a Lab who would have been named Apollonia if she hadn’t come with a name. She chewed so many things that I used to tell her that she was in danger of having all her teeth pulled out. I’m sorry – what is ANTS? I feel bad for Appolonia, getting blown up by a car bomb. Oh, wait! Wrong Appolonia. But the female doctor got my vote. Oh that modern day dentists would follow the example of Zenaida’s so that we could affordably …. receive with her [Apollonia] the crown of life. That’s Appollonia. In the end, Michael is alone. Crime doesn’t pay. Neither does medicine, apparently, unless you get your tetanus shot. Go, women physicians. My vote is for Zenaida and her desire to make medical treatment available to all drew me; especially living in Idaho which has a high Medicaid gap where a large number of citizens either don’t make enough to qualify for regular insurance, but also make to much to qualify for Medicaid. Although the issue has also been going on for many years, Idaho just did vote for Medicaid expansion this year although it too doesn’t begin until 2020. Although I thought Appolonia’s martyrdom very heroic, thinking about how much this particular issue has hit locally as well with the local Free Clinic backed up, and a local clinic which has a sliding scale and at least three different branches having the same issue I couldn’t help but think how much in our present day that there need to be more Medical Professionals like Zenaida!